Authorities arrested 34-year-old Eric Paul Ivanoff for driving under the influence in Southern California, after he caused an awful accident last Friday evening in Orange County. Police in the community of Cypress had set up a checkpoint, which had been operating for just 30 minutes, when Ivanoff’s vehicle smashed into several cars waiting in line. The force of the collision injured three people badly enough that they had to be hospitalized. (All were listed in stable condition, as of this posting). After booking Ivanoff on charges of hit and run, DUI, resisting arrest, and resisting arrest with violence, authorities set his bail at $100,000. Obviously, the whole story is scary and sad for many reasons. The situation illustrates, dramatically, how DUI defendants can make their situation much, much worse, even after getting caught or stopped by the police. As Ivanoff approached the checkpoint, he might have been self-conscious. Perhaps he had consumed several drinks before getting behind the wheel. So he might have anticipated that police would have arrested him. 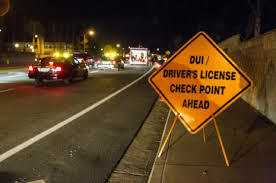 Getting busted at a checkpoint is obviously no fun, and a misdemeanor DUI charge can lead to several days in jail, the loss of your California driver’s license, mandatory alcohol school, tough probation terms, spikes on your car insurance rates, and other indirect problems. However, since he hit and hurt other people, he likely will now be charged per California Vehicle Code Section 23153 (the injury DUI law). This means that he could face over a year behind bars for each person he hurt while driving DUI. As if that wasn’t bad enough, he (allegedly) got out of his car, fled the scene, and then attacked an officer. Each one of those mistakes, on its own, could complicate his defense tremendously. Hit and run is a serious crime, as is resisting arrest, as is resisting arrest and then hitting an officer. Fortunately, no one died in the accident, but it holds important object lessons. If you or someone you love faces complex Los Angeles DUI charges, call the effective and thorough legal team here at the Kraut Law Group for a confidential case consultation.